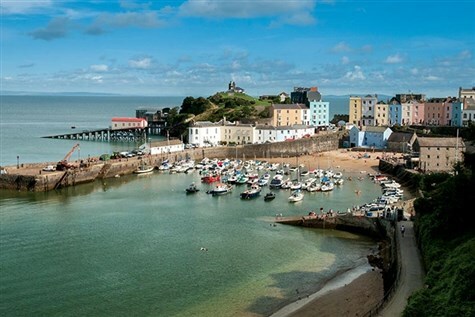 The walled town of Tenby is picture perfect  with golden sands, candy coloured houses, pretty harbour and clear waters. The town bustles with an array of shops, cafes and restaurants, and you can take a boat trip out to Caldey Island from the harbour, famous for its abbey and ancient priory church. SCOLTON MANOR AND ST DAVIDS: Explore the traditional Victorian country house, surrounded by sixty acres of paprk and woodland, including walled gardens and check out the Pembrokeshire Bee Keeping Centre and Honey Kitchen. We spend the rest of the afternoon in St David's, the smallest city in Britain. MUMBLES AND THE GOWER: We head south through Kidwelly to the picture postcard resort of the Mumbles for some free time. Then we pick up a guide to tour the Gower Peninsular, a designated 'Area of Outstanding Natural Beauty'' and enjoy a cream tea at the heritage centre. ABERGLASNEY GARDENS AND CARMARTHEN: enjoy this garden which was lost in time and abandoned for fifty years, it is more than ten acres of ancient gardens as well as the award winning Ninfarium. carmarthen is the oldest town in Wales, with medieval lanes and Georgian buildings. Situated on the Esplanade, with breathtaking views of South Beach and Caldey Island. all ensuite rooms have TV and tea/coffee making facilities. There is a restaurant, bar, games room and a lift to half floor landings.